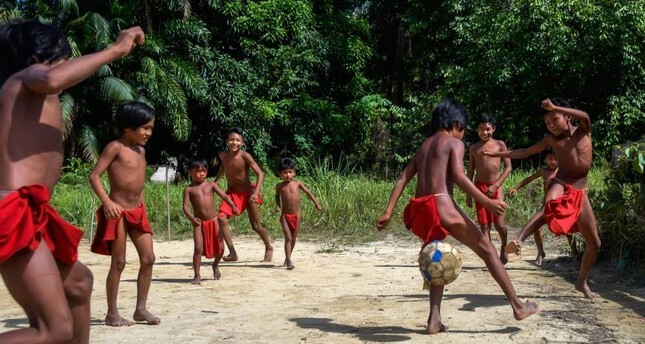 Waiapi boys play football in the Manilha village. Transfixed, tribal villagers in Brazil's Amazon rainforest look up, pointing at the sky. The sight of the aircraft, just a silvery dot high above the Waiapi settlement of Manilha, mesmerizes the villagers, who are naked except for bright red loincloths and red-and-black body paint made from the seeds of urucum and jenipapo fruits. "Do you think it came to look at us?" asks Aka'upotye Waiapi, 43, elder son of the chief. Even after the disappearance of the plane - from which the Amazon must appear as little more than a dark green carpet - a feeling of unease remains. The Waiapi only came into contact with the Brazilian government in the 1970s. To this day, they exist much as their ancestors did before Europeans arrived in South America five centuries ago, living in harmony with the planet's biggest rainforest. A Waiapi man uses a solar amateur radio to talk to another village at the Waiapi indigenous reserve. But the outside world is getting ever closer. At first glance, life in Manilha and dozens of other tiny settlements of thatched, open-sided houses appears to be from another age. Men hunt and fish, bare-breasted women harvest cassava and tend the fires, and all, from young children up, smear themselves in the natural dyes that the Waiapi believe protect both body and soul. There are no shops, there is no need for money. Unlike tribes that have become almost tourist attractions, the Waiapi rarely accept visits by outsiders, even journalists. Yet you don't have to look as far as the sky for signs of change. One tribesman has a cellphone stuck in his loincloth that he uses to take pictures, even if there is never a signal here, while another owns Manilha's only car, despite currently lacking gasoline. From under a thatched roof comes the blaring of a solar-powered VHF radio, used to connect Waiapi villages scattered through the forest. And while Manilha gives the appearance of being lost in the throbbing heart of the rainforest, everyone knows that really the industrialized 21st century is no more than two hours of rough driving south in the sleepy town of Pedra Branca. Many of the approximately 1,200 Waiapi almost never visit Pedra Branca, but Jawaruwa Waiapi travels there every week, switching between two worlds like a time traveler. The 31-year-old, who lives up a steep hill of dense jungle, made history last year by becoming a city councilor. He is the first of his tribe to win an elected post - a rare example of a Waiapi plunging fully into what they call the "white man's" territory. In Pedra Branca, Jawaruwa Waiapi wears jeans and a neat checked shirt, and sits behind a desk. "You have to follow the rules of the city. Here you need money to live, you need to pay for everything," he says. "Back in the village you don't pay for anything - water is free, the firewood is free." Returning to Waiapi lands later that day, he strips down to the traditional loincloth. His wife Monin, dressed similarly, smears him in urucum and he returns the favor. Jawaruwa Waiapi says he ran for office because there was not one indigenous person on the council, just as there are no indigenous lawmakers in the national Congress. "Who else will fight for our people?" he asks. Marina Sa, who owns a restaurant in Pedra Branca and has helped the councilor integrate, says Jawaruwa Waiapi's presence is just as novel for the Brazilian locals. "Few people have gone [to Waiapi territory]. It's a separate world." A burden seems to fall from Jawaruwa Waiapi and his family when they return to their tribe, where the loudest sounds are bird calls and the sun governs daily routines. "The children don't like it in town," says his wife Monin, 24. "They have to wear clothes and take showers (rather than bathe in the river)." But, looking down at his 4-year-old son - one of four children - Jawaruwa Waiapi worries. Many young are sent to study and usually they come back, but what if they don't? "If he goes out beyond the village and ends up liking cities, he'll never want to have the Waiapi people's culture," Jawaruwa Waiapi says. One tribesman who left for 20 years and returned says it took him four years to become "a full Waiapi again." "There's a lot of evil in the world," Calbi Waiapi, 57, said. But for Kamon Waiapi, who travels regularly to Pedra Branca as an assistant to Jawaruwa, the key to survival is remembering who you really are. Joining Agence France-Presse (AFP) journalists on a ride into town, Kamon Waiapi exited the car at the outskirts and removed his red loincloth, slipping on a pair of jeans, leather shoes and a polo shirt. "Now I'm a white man," he said. Did the clothes make him feel less Waiapi too? "No," the 25-year-old answered without hesitation. "Inside, I never change."